Many people prefer the natural beauty of hardwood floors. It’s also nice knowing your flooring selection can give you years of enjoyment. But if you’re ready to install hardwood flooring, make sure you are ready for the upkeep that will keep them in top shape throughout the years. Refinishing is a process. And while it isn’t something you’ll have to do on a regular basis, it can help you make the best selection now as you’re installing hardwoods throughout your home. 1. There are three types of finishes you can choose for your hardwood floors. Polyurethane comes in oil or water based applications. Polyurethane will provide varying degrees of luster with a plastic looking finish. This is a great choice for high moisture or high traffic areas. Varnish provides a matte to glossy finish with varying degrees of luster. It will darken with age, but is easier to spot repair than polyurethane finishes. Penetrating sealers provide a natural look finish that brings out the natural grain of the wood. It is the least durable of the finishes, but is the easiest to repair. 2. One of the best reasons to select hardwood flooring is for the longevity of the product. 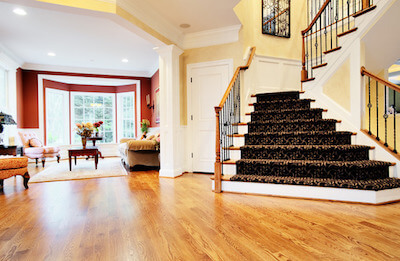 Hardwood flooring can last as long as 100 years, depending on the location and the care. In most cases, hardwood floors can be refinished about ten times before the wood needs replacing. 3. Refinishing doesn’t always mean sanding. A lot is determined by the damage to your hardwood planks. If your wood is minimally scratched and the wear doesn’t reach the actual wood, simply removing the finish and scuff sanding it may be all you need before refinishing it. 4. Refinishing is a process. You’ll need several days to finish the procedure from start to finish. It’s best to seal floors the same day as sanding to prevent moisture being absorbed back into the wood. You’ll need to let sealant dry at least 24 hours before you begin to use your flooring once again. 5. Oil is an enemy for hardwood floors. You can’t buff a room that has been cleaned or waxed with an oil based soap. It has to be stripped off before cleaning and refinishing. 6. Small gouges, scratches and dings can be fixed easily with a wood putty. If you are having hardwood flooring installed and you have access to sawdust created from your hardwood, save some to mix into a putty to ensure your wood filler matches your flooring exactly. 7. Finishes are not like paint; you can’t keep applying coats. If one coat isn’t applied properly, it must be buffed to remove impurities before reapplying.